Frank VanderSloot-Mother Jones lawsuit: Former Mitt Romney co-chair sues magazine for defamation. 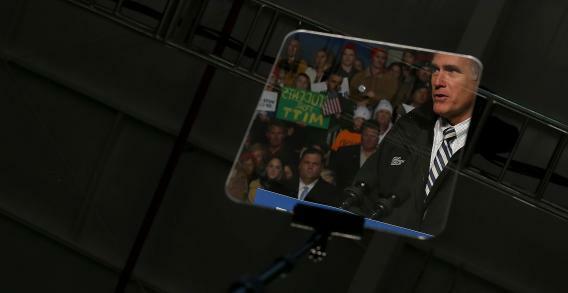 Mitt Romney is seen reflected in a teleprompter as he speaks during a campaign rally at the Smithfield Foods Hangar on November 4, 2012 in Newport News, Va.
Frank VanderSloot is suing Mother Jones magazine because he contends he was defamed by an article that depicted him as a “gay-basher.” VanderSloot, the CEO of direct marketing company Melaleuca, … says a February 2012 article about him and two tweets promoting it prompted national criticism. The 2012 article in question was titled, “Pyramid-Like Company Ponies Up $1 million for Mitt Romney.” While the company has previously found itself in hot water at both the state and federal level for the aforementioned “pyramid-like” nature of its business, VanderSloot’s specific complaint is focused instead on how he was portrayed in the article. In a statement provided to local media, the company claims that the magazine “engaged in a malicious and reckless effort to damage VanderSloot’s reputation” because of the “sizable donation” he made to Romney’s presidential campaign. The article incorrectly described statements made by VanderSloot, Melaleuca’s CEO, in the Post Register ad. In the ad, VanderSloot repeated allegations—which he attributed to others—that reporter Peter Zuckerman’s sexual orientation had moved him to “attack the Boy Scouts and the LDS Church.” VanderSloot said it would be “wrong” to draw conclusions about Zuckerman’s motives.